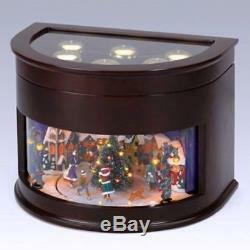 Christmas MUSIC BOX ANIMATED SYMPHONY OF BELLS TRAIN 50-Songs #XM1024. Christmas 75th Anniversary Grand Animated Symphony of Bells Train Music Box. This holiday showpiece has been created with a rich wood finish, a hinged top with glass window, and hand-painted detailing. Six brass bells create the sound of a symphony, which softly accompanies 25 classic carols. Once the holidays have come and gone, you don't have to pack it away. Keep this melody maker on display all winter long while you rock along to its 25 all-time favorite songs. Peer through the glass window to view train, with delicately hand-painted figures and tiny LED lights. The train chugs around a Christmas tree, and the tree, houses, and stars twinkle in the night. Lift up the glass top to see and hear the six tuned brass bells in their full glory. The 50 songs play along in old-time music-box style, while the bells chime in multipart harmony. Includes music box and AC adapter. Plays 50 songs: 25 holiday songs and 25 all-time classics. Adjustable volume; choice of bells only or bells with music. Close for soft sound; open for full sound. Measures 11"W x 7-1/2"H x 7-3/4D. Christmas MUSIC BOX ANIMATED SYMPHONY OF BELLS TRAIN 50-Songs ships FREE" is in sale since Monday, April 24, 2017. This item is in the category "Collectibles\Holiday & Seasonal\Christmas\ Current (1991-Now)\Other Current Christmas Décor". The seller is "gottosellmystuff" and is located in Rancho Cucamonga, California. This item can be shipped to United States, Canada, United Kingdom, Denmark, Romania, Slovakia, Bulgaria, Czech republic, Finland, Hungary, Latvia, Lithuania, Malta, Estonia, Australia, Greece, Portugal, Cyprus, Slovenia, Japan, China, Sweden, South Korea, Indonesia, Taiwan, Thailand, Belgium, France, Hong Kong, Ireland, Netherlands, Poland, Spain, Italy, Germany, Austria, Russian federation, Israel, Mexico, New Zealand, Philippines, Singapore, Switzerland, Norway, Saudi arabia, Ukraine, United arab emirates, Qatar, Kuwait, Bahrain, Croatia, Malaysia, Chile, Colombia, Costa rica, Dominican republic, Panama, Trinidad and tobago, Guatemala, El salvador, Honduras, Jamaica.